Discussion in 'Diablo 3 General Discussion' started by Flux, Feb 2, 2015. Prompted by the Seattle Seahawks' bizarre decision to not win the SuperBowl, I started thinking about similar things possible in Diablo 3, and found several unpleasant examples in my head. Mistakes aren't necessarily fatal or permanent, ala our Diablo 3 Darwin Awards, but are annoying and self-generated. The most common method for this in D2 was to misclick a stat or skill point. Without respecs in the game (until years after release) any such mistake was permanent, and you could play 80 more levels with that 1 wasted point staring at you every time you opened the character sheet. 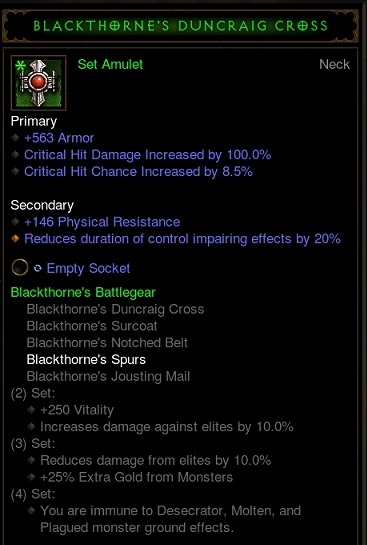 Back in early Season 1 I found a nice Blackthorn's amulet, with a big roll to dex, plus CC, CD, and armor. I took it straight to the Mystic to enchant the armor into a socket, while between Rifts in a multiplayer game, and somehow in my haste to get back to the Rifting... I picked the wrong affix. And didn't even notice until I went to the jeweler to remove the LGem from my current amulet and stick it into the new one... which was suddenly a LOT less green on DPS than it had been. I used it for a while on a Monk, who enjoyed the big Defense, but always the loss of so much DPS haunted me. I still have the amulet, staring at me from a corner of my stash, and while I sometimes use it on a follower, it's mostly a reminder to be careful at the Mystic. There once was a disease called Diablo 3. It plagued my mind for months at a time, creeping from the dark corners of what was once my brain, until it completely liquified any organic matter that was trapped under a hard dome like object, commonly referred to as a skull by most humans at the time. Eventually this plague reached to my vision center, causing me to close my eyes uncontrollably, despite the desire to continue to click my mouse, and press the 1, 2, 3, 4, q,shift, ctrl, and alt buttons. My visual center was impaired to a point that the disease forced me to destroy a 1200 dps wand, thinking i was selling a recently found 200dps wand. The uncontrollable right and left clicking caused me to equip the recently found wand by accident, since the disease had caused a lack of brains as well as lack of proper vision. At the time, 1200dps weapons were among the hardest to acquire, and it took many months of clicking and delirium inducing music from the Benny Hill show just to acquire the amount of currency just to acquire this 1200dps wand in the first place. The disease called Diablo 3 had fully taken control, and it engulfed me from the inside out. In a blind stupor, it made me right click incorrectly, and then leave the game after I sold the wand to the merchant. Both wands looked the same, both were blue, both had similar numbers, with the exception of the mysterious fourth digit in the dps. The next day, the disease seemed to be in remission, and vision had returned to me. The ability to click correctly had once again inhabit my fingers. The ability to process thought and analyze numbers came back to the liquified husk that was once my brain. I went to kill monsters, and I died from Quill Fiends. Regular Quill Fiends. White Quill Fiends. "Why am I doing no damage?" I thought to myself, as I checked to see what was wrong in my character. I saw my dps was significantly lowered, and upon further inspection, I found the culprit. I frantically checked the stash in town, and I could not find my 1200dps wand at all. The disease caused me to destroy it, and made me realize, an innocent wand was killed. That wand will never know the warmth of another hand holding it. It will never gush forth with magical energy, spewing its arcane essense towards another target. It will never know the oil and polish from another blacksmith attempting to repair any damage it might have taken. It will never again delve into the deep holes under the ground where the demons and goblins dwell. It is gone, forever, all because of this disease that held me under it's thumb. The disease called Diablo 3. I feel like this every time I leave a game and forget to close a rift and claim the reward. Can't tell you how many times I've done this... I really wish you'd get some sort of warning that you're leaving a game with a rift reward unclaimed.